British actress Emilia Clarke has dyed her naturally brown hair blonde. 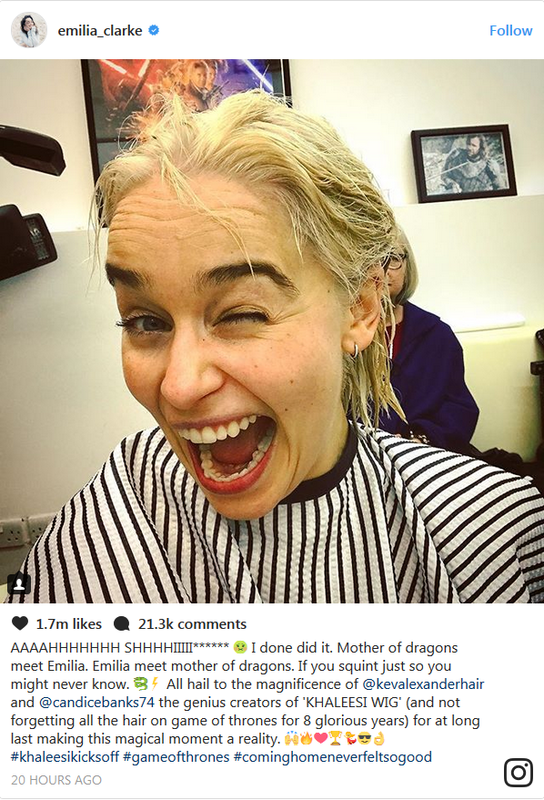 "AAAAHHHHHHH SHHHHIIIII****** I done did it," the Game of Thrones icon posted on Instagram Tuesday, alongside a photo of her with wet, light-colored hair and sitting in a salon chair. "Mother of dragons meet Emilia. Emilia meet mother of dragons. If you squint just so you might never know. All hail to the magnificence of @kevalexanderhair and @candicebanks74 the genius creators of 'KHALEESI WIG' (and not forgetting all the hair on game of thrones for 8 glorious years) for at long last making this magical moment a reality. #khaleesikicksoff #gameofthrones #cominghomeneverfeltsogood"
Clarke has played Queen Daenerys Targaryen on the HBO fantasy drama for seven seasons. The upcoming, eighth season will be the show's last.